Top row (left to right): 1. Mrs Callahan, 2. David Brundage, 3. Patty Garcia, 4. Bob Evans, 5. Kay Atkinson, 6. Mike Horton, 7. Carolyn Clark, 8. Bruce Frame. Second row: 1. Jay Battershill, 2. Margie Reay, 3. no picture, 4. no picture, 5. no picture, 6. no picture, 7. Charles Hennan, 8. Linda Thomas. Third row: 1. Lorraine Schroeder, 2. Steve Nordahl, 3. Carol Bargmann, 4. Chuck Seaborg, 5. Marilyn Miller, 6. Jeff Meyers, 7. Roxanne Hill, 8. Bob Ruff. Fourth row: 1. Bob Parr, 2. Jim (Jimmy) Triumph ?, 3. Gary Bettridge, 4. Kent Yarborough, 5. Bryant Bennett, 6. Jack Barnes, 7. Mike Cude, 8. Tim Vargas. Credits: From the collection of Margie (Reay) Kiser. Scanned by Brian McFann. Thanks to Margie Kiser, Karin McMahon Reitz, Bruce Frame, and Carolyn (Clark) Montandon for identifying the kids in the picture. The kids in the picture are members of the high school graduation class of 1967. To find other pictures of the class of 1967 in the archive, see Livermore class pictures listed by year of high school graduation: 1967. And if you have any pictures of the class of 1967 that you would like to share, please submit them to the Archive. 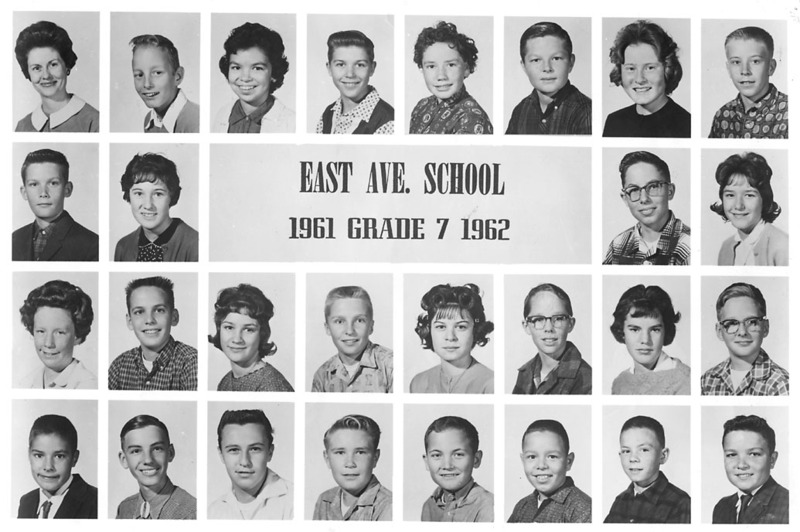 To find other pictures from East Avenue School in the archive, see Livermore class pictures listed by school: East Avenue School. And if you have any pictures from East Avenue School that you would like to share, please submit them to the Archive.